With 40% of LinkedIn‘s 300 million users accessing the social network for professionals via mobile devices, the company has been stepping up a gear on its mobile business, adding new apps around specific experiences like job hunting. Today comes the latest development on this front, a new app called LinkedIn Connected. Designed as the next generation of its Contacts app — launched a year ago as a kind of personal assistant and now getting retired — Connected will be more than just a place where you can manage your contacts: the idea here is to strengthen relationships with connections you already have. It’s another step forward in the company’s bigger bid to be an intelligent layer on top of a basic contacts database — a play on a wider strategy to do more in anticipatory computing, an emerging area in app development that plays on ideas of artificial intelligence and big data to “predict” what a user may want to see or do next. “More and more apps should just infer what I need next. It’s like going to your favorite restaurant and they know your name, what you like, and how to cook it. As a result they anticipate what I need before I have to ask,” LinkedIn’s VP of Mobile Joff Redfern writes. There are others going after this space as well. Humin, an app yet to be released, is going after a similar concept to LinkedIn’s Connected: it strives to work within a relevant context for the user to help them access their connections in a way that lets them network effectively. According to LinkedIn, most users log on to the platform for just a few minutes every morning between 6-10 to check for updates and get key background info on those they might interact with during the day. The idea here is that Connected will not only bring you alerts that will draw you into using the app more, but also extract out the kind of information that you are already proactively searching for such as profile updates, job changes, work anniversaries, birthdays and key business interests. 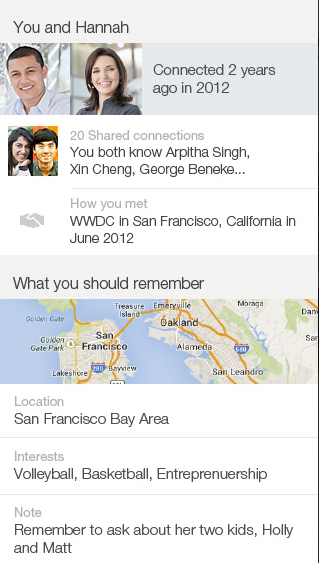 The app will also allow users to look up key information about a potential connection. LinkedIn believes this to be particularly helpful in adding context to a potential or new connection right before a meeting. 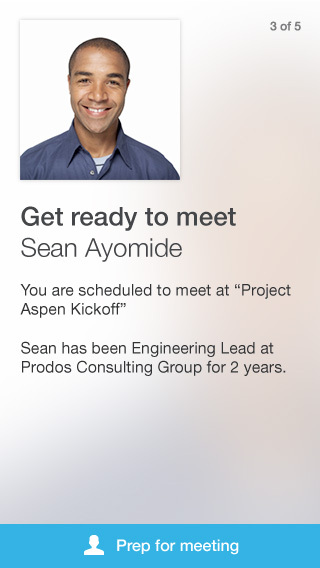 It also says users can get reminders about that meeting within the app. In a way, the use of Connected is not completely a surprise: it’s a return to a brand it picked up in 2011 when it acquired the startup Connected. In an average week there are more than 9 million comments, likes and congratulations posted across LinkedIn for updates like job changes, birthdays, being mentioned in the news and work anniversaries, the company tells us. Put that together with the kinds of searches people do on the platform every morning and then combine that with an increasing focus on mobile for the company. 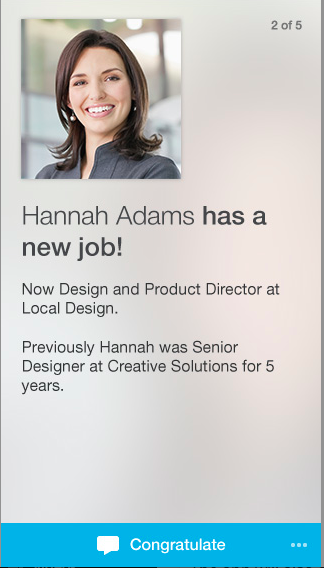 It seems only natural for LinkedIn to create a separate app that anticipates the desire to get relevant information on those whom they are connected to. It simplifies the process of remembering how you are connected and why before you interact with that person again (or for the first time). The new app will only be available in English speaking countries and on iOS for now, though LinkedIn Senior Manager of Corporate Communications, Krista Canfield, did say an Android version is on the roadmap. Update: Humin app reference clarified — it’s not a LinkedIn app, but a potential competitor to Connected.